Assam Chief Minister Sarbananda Sonowal on Tuesday said that the women would have to inspire the youth to indulge in positive work with positive thought. 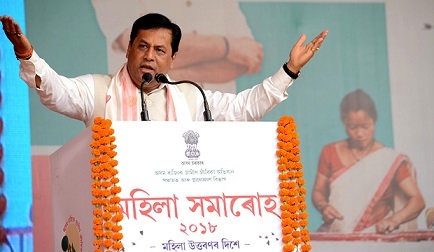 “They (women) must nurture the youth with best human values,” said Sonowal during a Mahila Samaroh in Nalbari. Sonowal ceremoniously handed over cheques of revolving fund under Kanaklata Mahila Sabalikaran Achoni amounting to Rs 25,000 each to 22 women Self-Help Groups (SHGs) coinciding the Mahila Samaroh, which was held at Chamata in Nalbari district. Altogether 4606 SHGs within the jurisdiction of Barpeta Lok Sabha constituency covering three districts have been identified by the Assam State Rural Livelihood Mission (ASRLM) to receive the revolving fund. 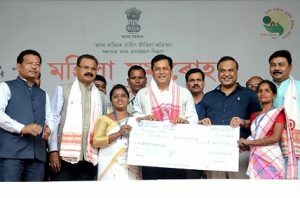 Addressing the Mahila Samaroh organized by the Panchayat and Rural Development Department, Chief Minister Sonowal exhorted the women to guide the youth on the path of righteousness. Stating that the State Government puts emphasis on women empowerment and takes up schemes like Kanaklata Mahila Sabalikaran Achoni to make them economically self-reliant, the Chief Minister expressed confidence that such initiatives would further propel overall growth of the state. He also urged the SHGs to work diligently and announced that the first three best performing SHGs would be awarded Rs 5 lakh, Rs 3 lakh and Rs 3 lakh respectively. The CM further reiterated the State Government’s commitment to ensure social security and economic prosperity of all sections of the people and averred that efficient and transparent execution of welfare schemes leads to faster development in the society. Moreover, the CM appreciated the cooperation and positive role of the people at the time of publication of the first draft of the NRC and urged them to exhibit similar temperament at the publication of second draft as well. He also sought media’s support in building a just and better society. Minister for Health & Family Welfare and PWD Dr Himanta Biswa Sarma in his speech said that the State Government has taken up several initiatives to bring about rapid economic progress and wholesome growth of the people and Kanaklata Mahila Sabalikaran Achoni was one such scheme aimed at empowering the women. He also informed that SHGs would be provided additional grants based on their performance, which would go up to Rs 5 lakh. Dr Sarma also underlined various welfare schemes being implemented in health, education and other sectors in the state. Industry & Commerce Minister Chandra Mohan Patowary, P&RD Minister Naba Kumar Doley, HOUSEFED chairman Ranjeet Dass, Deputy Mayor of GMC Bijuli Kalita Medhi also spoke on the occasion. While Nalbari DC Sanjib Kumar Das delivered the welcome speech, the Mahila Samaroh was also attended by MLAs Ashok Sharma and Narayan Deka, chairman and deputy chairman of various corporations and boards, MD of ASRLM Nandita Hazarika and several other dignitaries.